“The perfect kind of high-pressure adventure.” —TeenVogue.com A New York Times bestseller! 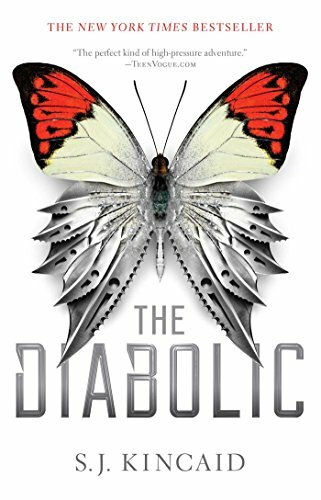 Red Queen meets The Hunger Games in this epic novel about what happens when a senator’s daughter is summoned to the galactic court as a hostage, but she’s really the galaxy’s most dangerous weapon in disguise.A Diabolic is ruthless. A Diabolic is powerful. A Diabolic has a single task: Kill in order to protect the person you’ve been created for. Nemesis is a Diabolic, a humanoid teenager created to protect a galactic senator’s daughter, Sidonia. The two have grown up side by side, but are in no way sisters. Nemesis is expected to give her life for Sidonia, and she would do so gladly. She would also take as many lives as necessary to keep Sidonia safe. When the power-mad Emperor learns Sidonia’s father is participating in a rebellion, he summons Sidonia to the Galactic court. She is to serve as a hostage. Now, there is only one way for Nemesis to protect Sidonia. She must become her. Nemesis travels to the court disguised as Sidonia—a killing machine masquerading in a world of corrupt politicians and two-faced senators’ children. It’s a nest of vipers with threats on every side, but Nemesis must keep her true abilities a secret or risk everything. As the Empire begins to fracture and rebellion looms closer, Nemesis learns there is something more to her than just deadly force. She finds a humanity truer than what she encounters from most humans. Amidst all the danger, action, and intrigue, her humanity just might be the thing that saves her life—and the empire. Nemesis is a Diabolic, a creature with heightened strength and power. A Diabolic has only one mission: To protect their loved one… no matter what. Sworn to protect Sidonia, whose father belongs to the galactic Senate, Nemesis has no mission other than to protect Sidonia. However, when Sidonia’s father causes trouble throughout the empire, Nemesis must be sent in place of Sidonia in order to appease the higher-ups. But a Diabolic isn’t taught human tendencies, and Nemesis needs those more than ever.